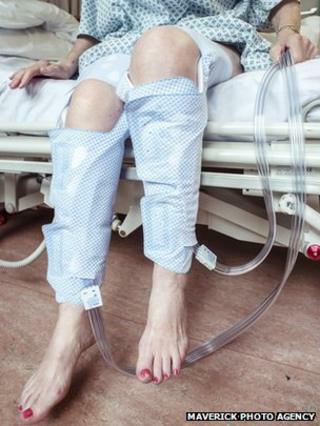 Cheap inflatable leg wraps may save the lives of patients after a stroke, according to research in Scotland. The devices regularly squeeze the legs to keep blood flowing and prevent formation of fatal blood clots. A trial with 2,876 patients, published in the Lancet, showed there were fewer clots with the wraps. The Stroke Association said the results were "extremely encouraging" and had the potential to save thousands of lives. A clot in the leg, a deep vein thrombosis, is normally associated with long flights, but is a problem for hospital patients unable to move. Around 60,000 people a year in the UK are immobile when admitted to hospital after a stroke. Doctors at Western General Hospital and the University of Edinburgh said compression socks did not improve survival and clot-busting drugs led to other problems, including bleeding on the brain. They tested the devices, which fit around the legs and fill with air every minute. They compress the legs and force the blood back to the heart. They were worn for a month or until the patient recovered and was able to move again. In the study, 8.5% of patients using the compression device developed blood clots, compared with 12.1% of patients who were treated normally. Prof Martin Dennis said: "At last we have a simple, safe and affordable treatment that reduces the risk of deep vein thrombosis and even appears to reduce the risk of dying after a stroke. "We estimate that this treatment could potentially help about 60,000 stroke patients each year in the UK. "If this number were treated, we would prevent about 3,000 developing a deep vein thrombosis and perhaps save 1,500 lives." He said the system should also be tested in other immobile patients, such as those with pneumonia. Prof Tony Rudd, who chairs the Intercollegiate Stroke Guideline Group at the Royal College of Physicians, said: "This study is a major breakthrough showing how a simple and safe treatment can save lives. "It is one of the most important research studies to emerge from the field of stroke in recent years." Dr Dale Webb, of the Stroke Association charity, said: "The results of this research are extremely encouraging and show that using a compression device on the legs of patients at risk of developing blood clots could be a more effective treatment. "This new device has the potential to save thousands of lives and we would like to see it incorporated into national clinical guidelines."